The air above Santa Rosa was socked full of smoke, but Steve Shrum had a plan for getting above the smoky haze. On Thursday afternoon, Shrum, 46, set out on his once-a-week hike to the top of Taylor Mountain — 1,400 feet up and 5.5 miles there and back. He did it with some trepidation. An asthma sufferer since youth, he checked beforehand to make sure it was not at risky levels. In Sonoma County, at least, it was not. Its source was no secret: wildfire smoke from the massive inferno burning across Mendocino and Lake counties and wildfires elsewhere in the state has combined with vehicle emissions and other pollutants to produce unsightly if not unhealthy air quality in recent days. 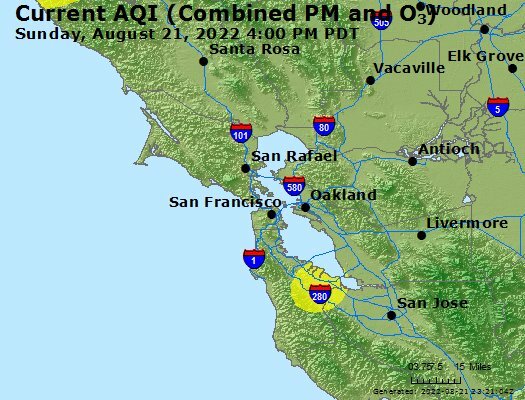 On Thursday, Bay Area regulators triggered the second consecutive “Spare the Air” alert, including a host of advisories against driving and wood-burning and exercising outdoors after the morning hours. Elderly people, children and those with respiratory illnesses were urged to take extra measures to avoid prolonged exposure. Officially, Sonoma County saw moderate air quality Thursday, while areas of Mendocino and Lake counties had air considered unhealthy for sensitive groups or just plain unhealthy. The worst air in the state was concentrated around fire zones and extends throughout the Sacramento and San Joaquin valleys and across the Sierra Nevada. Only small pockets of the state —on the Humboldt County coast, the Central Coast and inland desert — had good air quality. Such is life now in California’s expanding, ever-worsening fire season, delivering another hardship even for those who’ve escaped the flames. David Eby, 68, of Blue Lakes in Lake County said even though the Ranch fire’s active flames were now miles away, on the north and east end of the historic conflagration, the skies over his community were filled with smoke. James Driscoll, a pulmonologist for Kaiser Permanente in Santa Rosa, said residents should regularly consult air quality indices at such times to determine how they can avoid the worst of the pollution. The most accessible, color-coded index can be found at airnow.gov, with ratings ranging from healthy to hazardous. “When the air quality is bad, people can get breathing problems, such as shortness of breath, cough, sore throat, nasal irritation, even eye irritation,” Driscoll said. “If you’re outside, avoid vigorous activities where you’re going to breathe more deeply and more rapidly,” he said, adding that those most as risk are older people, young children and people with chronic lung problems. When air quality reaches unhealthy levels — red on the government index — people should consider using respiratory protection if they must be outside. A properly fitted N95 mask, like those prevalent during the October firestorms, is the most cost-effective protection. Some relief is in store for parts of the region reached by coastal breezes and cooler temperatures. Those favorable patterns are expected to improve air quality today. “We’re getting a lot of onshore breeze, that sort of cool clean air that’s coming off the ocean, and that’s becoming a lot more present beginning (Friday), so we expect the air quality to improve quite a bit,” said Ralph Borrmann, a spokesman for the Bay Area Air Quality Management District. The last time air quality exceeded federal health standards in the nine-county Bay Area was Aug. 3 in Livermore, and that was because of ozone pollution, not wildfire smoke, Borrmann said. Even the smoky skies in Sonoma County on Thursday were a far cry from what the region experienced during the October wildfires. David Robinson, the park manager for Sonoma County Regional Parks, hadn’t noticed any sharp decrease in visitors as of Thursday afternoon, though the smoke had made his own eyes “definitely kind of itchy.” Parks officials saw a slight drop-off Wednesday in swimmers at Spring Lake Regional Park, though the numbers ticked up again as temperatures rose, Robinson said. Still, some parks staff took their employer’s advice and donned respirators this week. “We always want to urge people to know their body, know their surroundings and adhere to any of the warnings that are out there,” Robinson said. For parents with children out on summer recess, the heavy smoke presents not just health but scheduling concerns, scuttling plans for camping trips, soccer games and other outdoor activities. About 20 children ages 7 to 11 years old were participating this week in an environmental education camp at Spring Lake that included swimming in the lagoon and kayaking, according to park program manager Sandi Funke. Park officials were keeping an eye on the air quality levels, which remained in the moderate range Thursday afternoon, and would move campers indoors if conditions worsened, Funke said. Out on the Sonoma Coast, the fires’ impact remained visible even amid foggy conditions. Nonetheless, Nealy said Sonoma Coast State Park campgrounds were booked through the weekend. “Unless somebody leaves or cancels, we don’t have any sites,” he said. Shrum, however, said he did notice far fewer hikers at Taylor Mountain on Thursday. He encountered only a few people on foot and a lone cyclist. “Usually, on days like this it’s packed,” he said. You can reach Staff Writers Martin Espinoza at 707-521-5213 or martin.espinoza@pressdemocrat.com and J.D. Morris at 707-521-5337 or jd.morris@pressdemocrat.com.